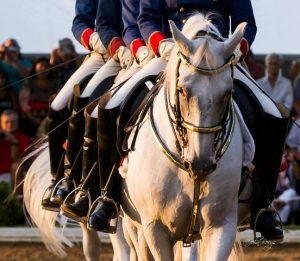 The Tempel Lipizzans perform classical riding in the tradition of 16th century European riding. Come witness artistry, athleticism and coordination between horse and rider in a unique, live performance. Located in Old Mill Creek, IL on the property of Tempel Farms, Tempel Lipizzans is a full time dressage training facility in which experienced trainers adhere to the standards of training established hundreds of years ago in the classical schools of Europe. As of 2015, the Spanish Riding School in Vienna Austria, after which our American program was modeled, has 450 years of elevating classical equitation and has been added to the list of UNESCO’s “intangible cultural heritage of humanity.” The foundation of the Tempel Lipizzans breeding program was directly from Piber, the stud farm of the Spanish Riding School. $22 for groups of 15 or more. Behind-the-scenes tours available ( there is a charge for this). Enjoy a 90 minute performance followed by a self guided stable tour.